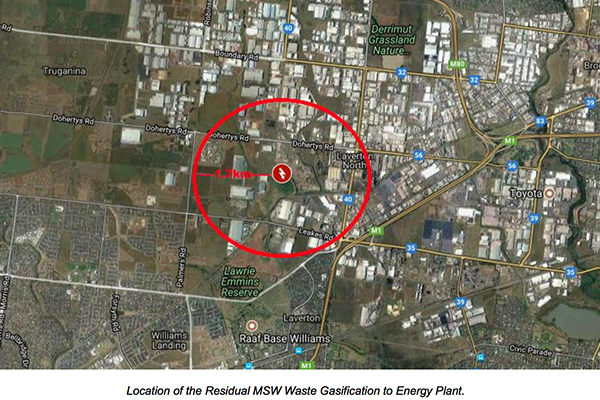 Recovered Energy Australia has submitted a planning application to Melbourne’s City of Wyndham to construct a waste to energy plant that would process 200,000 tonnes per annum of residual municipal solid waste. The company has proposed a site in Laverton North located on industrial zoned land. The gasification technology will divert more than 97 per cent or 194,000 tonnes of waste that was destined to go to landfill and at the same time recover the energy from the waste. According to Recovered Energy Australia, there will be 11-14 per cent of the waste that is non-organic creating 30,000 tonnes per annum of slag which can be used for clean fill, road base, bricks or tiles. The next step in the licensing and approval process is to submit an Environment Protection Victoria Works Approval application to show that it meets Victorian operational and environmental standards. The company in a statement noted that the gasification technology was selected for its superior environmental performance, its scalability and its ability to be commercially competitive with other waste disposal options. It said that the controlled air and high temperature of the gasifier also creates a process that is unsuited to the production or reformation of unwanted emissions. The company said the location was selected for its extensive buffer zone and position within an area identified by the Victorian Government as an existing Resource and Recovery Hub of state importance. It also has access to high energy consuming industries that could utilise the renewable power generated. “It is a fully enclosed building with high speed roller doors and operates under negative air pressure. This ensures no odour from waste or noise is emitted from the plant,” the company stated. Recovered Energy Australia will be able to service the residual municipal solid waste volumes from three or four councils.